My name is Eric Longenecker. I am a senior and graduating in December 2012 with a degree in Management Information Systems. I am taking part in Leadership Communications (MGT 422) as a part of my specialization, Management Communication. This is an exam I submitted in response to whether leadership was effective or not in the movie “Norma Rae.” Personally, this assignment fit my goals very well. I came into this specialization hoping to improve my leadership and communication skills. What better class to take, right? This assignment gave me a good glimpse of how to review the way others become leaders. The leader behavior used as the basis for this exam comes the film, Norma Rae, released in 1979. 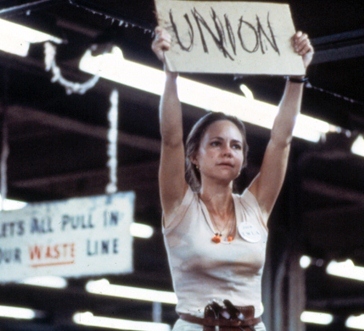 Norma Rae finds Sally Field cast in the title role, a minimum-wage worker in a cotton mill in Georgia in the 1970s. The factory has taken too much of a toll on the health of Norma Rae’s family for her to ignore her Dickensian working conditions. After hearing a speech by New York union organizer Reuben (Ron Leibman), Norma Rae decides to join the effort to unionize her mill. This causes dissension at home when Norma Rae’s husband, Sonny (Beau Bridges), assumes that her activism is a result of a romance between herself and Reuben. Despite the pressure brought to bear by management, Norma Rae successfully orchestrates a shutdown of the mill, resulting in victory for the union and capitulation to its demands. 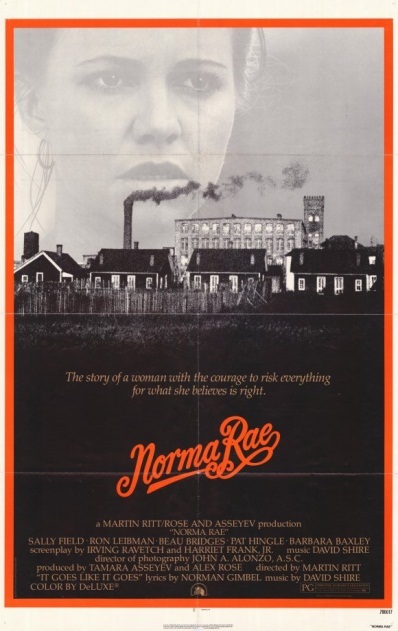 Based on a true story, Norma Rae is the film for which Sally Field won her first Oscar. The original trailer for the film may give you insight into the context of the leader’s behavior. Your task is to assess whether Norma Rae was thinking like a leader in the scene described below. More importantly, you must demonstrate your ability to explain Norma Rae’s success or failure as a leader of the mill workers, using what you have learned so far about the TILL system. Organize your response using the four questions that summarize TILL on pp. 51-52 of your Thinking and Interacting Like a Leader textbook. You should consider the roles of readiness, values, and media choice as discussed in Chapter 5. And you must give specific pieces of evidence from the dialogue (or script) to support your claims. You cannot perform adequately by providing BS about the movie or about leadership. Your response must apply the terminology from TILL in a persuasive analysis of leader behavior. The excerpt comes from the original script. It describes a scene in the mill where Norma Rae works. She is on the mill floor where all of the workers can see her. Clipboard in hand, Norma goes straight to the bulletin board where the company that owns the mill has posted a letter. It tells the white mill workers that black workers are going to run the union and use it to take control and push them around. Norma and the other union organizers know the company posted the letter to keep the union out of the mill. If they can show the letter to attorneys, they can use it to gain support for the union. Norma stands in front of the letter and writes briskly, snatching a phrase off the letter with a glance, then looking down as her hand scrawls quickly. In order to transcribe accurately, she reads each phrase aloud. NORMA (quoting): . . . that where unions are strikes occur. Strikes mean loss of work, loss of pay, and often loss of jobs. . . . Strike and trouble, which often end up in serious violence. . .
BOSS LUJAN: You can’t take down that letter. NORMA: It’s up here on the bulletin board – and I’m gonna copy it. BOSS PETERS (walking up): Norma, you better not. NORMA: I’m gonna take down every word of this letter. It’s my break time, and I’m gonna take down every word. Boss Peters reaches out for her arm, but she pulls away fiercely. NORMA: Just keep out of my way! I’m gonna take down this letter! BIG BOSS MASON (approaching): Hello, Norma. NORMA: Why, Mr. Mason, you know who I am. BIG BOSS MASON: Norma, you just put your pencil and paper away. Norma ignores him and continues to write as rapidly as she can. BIG BOSS MASON: You just stop what you’re doing – right now – ‘cause you’re about to leave. NORMA: You better not put a hand on me. Everyone looks at Big Boss Mason. BIG BOSS MASON: The law’s coming and it’s gonna take you right out of this plant. The men are stunned into silence. She calmly finishes, folds her notes, and shoves them in her pocket. BOSS PETERS: Let’s go to the office, Norma. Everyone on the mill floor watches as they walk to the office. Two other company men join them in the office. The group of men try to bully her but she won’t back down. BIG BOSS MASON (exploding): I don’t want you on the premises. You make a phone call to your husband and tell him to come fetch you. I want you out of here right quick. NORMA: You’re gonna have to call the law to get rid of me. And you better make it the Sheriff, too. It better be Sheriff Lamar Miller to come get me, it better be him, it better not be any policeman, ‘cause he was a friend of my daddy’s. I got a jealous husband and he knows Lamar and I won’t just go with anybody. Lamar Miller’s the Sheriff of Millageville so he better be the one. She walks out of the office and goes back to the looms. She merely stands there. Everyone on the floor watches in silence. A policeman approaches her. NORMA: It’s gonna take you and the police department and the fire department and the National Guard to get me out of here. I’m waiting on the Sheriff to come drive me home and I’m not budging until he arrives. Keeping her eye on the policeman, she fumbles for a piece of cardboard and her lipstick. She writes something. Then she hoists herself on top of a table. She holds her sign high over her head with both hands and slowly turns in a circle so that everyone can read what she has written. The first hand in the crowd to rise is Norma’s mother’s. Slowly the old woman’s arm rises above her head and stays there. The man next to her follows. James Brown raises his. Lucius White is next. George Hubbard follows. One by one, they join in. Norma continues to turn slowly with the sign held high. Each time she turns another batch of hands shoot up, holding their arms in the air, black and white. Finally, the entire mill floor is a forest of upraised hands. Finished, she climbs down. The Sheriff escorts her out of the mill and into a police car. Norma Rae was able to effectively lead the workers in the mill. She did not have to do much coaxing of the mill workers to get them on her side. In fact, it was almost as if she created a massive in-group in which all workers on the mill floor were in it. Norma Rae knew what she had to do to get her co-workers on her side. All they needed was for one person to stand up to management and lead the way. Norma Rae’s organizational purpose of her message was to direct members. She earns the respect of her members when she stands up to Big Boss Mason. She makes it very clear that she has every intention of being instrumental in forming a union. The action she is supporting is extremely urgent. When she says “Just keep out of my way! I’m gonna take down this letter,” she is alerting the members that they cannot let Big Boss Mason stand in their way of forming a union. And any resistance (such as the letter) is just a scare tactic used by Big Boss Mason and the mill. As mentioned earlier, it was simply as if Norma Rae created one large in-group that each mill worker was a part of. As far as Big Boss Mason and the management at the mill is concerned, Norma Rae is definitely in their out-group. It is in the above passage in which Norma Rae makes all the mill workers a part of her in-group. As soon as she came out of Big Boss Mason’s office, she made it very clear that she was ready to make a statement and she was going to make all the mill workers a part of it. Not leaving even a single person out is an example of very effective leadership. At this point, the mill workers are willing to go along with Norma Rae. If for nothing else, they would agree with her simply because of the respect she earned by standing up to Big Boss Mason. Norma Rae’s message will strongly and positively affect the ego needs of the members. She effectively met the need that each member had to be included by others. She made all of the mill workers a part of what was about to happen. With each member who went along with the idea of a union, Norma Rae’s message became stronger, and she gave everyone the opportunity to be valued. The script says, “Everyone on the floor watches in silence.” She knew she had the attention of the entire floor. Through her silent actions that would follow, she delivers an effective message to each member and values every hand that is raised. This is an extremely effective example of leadership. As they each raise their own hands, they are validating themselves. The members feel freedom to raise their hand and agree with Norma Rae. In terms of readiness, clearly each member is ready for this message. The script states that each member has raised his or her hand. All the members needed was someone to step up against the boss, and that made them ready to deliver their own message. Clearly, Norma Rae shares many of the same values as the other members. It seems as though none of the members are satisfied with the current situation at the mill. Norma Rae had to have known this, or she would not have been as willing to step up against Big Boss Mason in front of the entire mill. She shows effective leadership by knowing the values of the members she is trying to affect. Norma Rae effectively chooses to present the message face-to-face, but she does not say a single word when addressing the audience. She writes the message in one single word. By utilizing face-to-face and written communication, she is able to positively affect the autonomy and ego needs of the audience simultaneously. Her leadership choices were extremely effective, and she did not waste any opportunity she had. The bottom line is that Norma Rae knew exactly what she had to do. She gave each member the freedom to decide, but she showed them how important it was that they side with having a union. So, while each member felt individual freedom about their decision, they all still knew exactly what choice needed to be made. Norma Rae sold her message while valuing, freeing, and directing the members, and it was extremely effective. This is why her leadership got the job done. Kudos to Eric for a job well done on our first exam. His response demonstrated all of the characteristics I look for to judge my students’ ability to analyze the rhetorical context of a leadership situation. First, Eric provided a complete answer. It’s a critical workplace skill to show you read (or listened) to the instructions! He incorporated what he read about theory in his analysis of Norma Rae’s behavior. Second, Eric applied the sociolinguistic and leadership theories he read accurately to the scene from this film. He included several quotes from the script to make his claims more credible. and single written word tended effectively to the needs of her audience. Hi there, just wanted to mention, I enjoyed this article. It was funny. new to the whole thing. Do you have any tips for first-time blog writers? Sorry for the technical problem. Although I’ve been blogging for more than 2 years now, I don’t think I have any special wisdom to offer. It will all depend on your goals . . . This is indeed a very good comment. I am interested to read Thinking and Interacting Like a Leader textbook, i am sure it will do me a lot of good. I am desperate to learn how to address matters politely to management, as i lack tact when i am fighting for any injustices in the workplace. I am currently in the “bad books” with management, and i want to improve the way i communicate so that i don’t come off as disrespectful. Anyone willing to share a soft copy of the textbook, I will highly appreciate it.